If rumors from a person who’s usually not wrong are to be believed, the Steam Summer Sale starts on June 23 and ends on July 4. But does it have to end? Ever? Does it really? 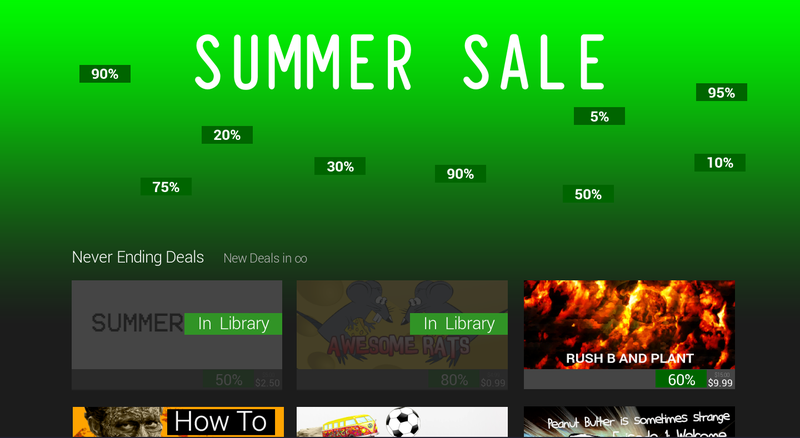 SwagPaladin has put together an admittedly rudimentary looking game that is, well, the Steam Summer Sale. It’s currently on Steam Greenlight. In it, you can “buy” fake games, play them, and, uh, do other stuff. There will be minigames and an in-game browser. It’s super dumb. It’s a clear grab for attention on a service that’s got serious issues. I got a chuckle out of it.